Ace Hardware Foundation recently announced the 2018 All Star Retailer Award – Ace Hardware Corp. 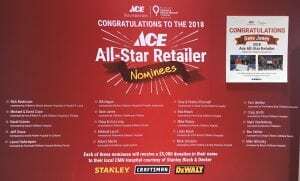 Ace Hardware Foundation recently announced the 2018 All Star Retailer Award. The award is given each year to an owner of one retailer for its extraordinary fundraising, leadership skills, innovation and commitment to Children’s Miracle Network Hospitals. During this event, Ace recognized David Grimes, owner or Handyman Ace, as a nominee for 2018 Ace All-Star Retailer. Grimes was nominated by Dayton Children’s Hospital. As a nominee, a donation of $5,000 will be made in Grimes’ name to Dayton Children’s Hospital. Next post: Miracle Buckets Making Waves!